Putting kimchi and cheese together might sound wrong, but trust me, it’s oh-so right. Spicy kimchi and melty cheese go together like burgers and fries. I wish I could take credit for inventing this brilliant combination, but I can’t–it’s quite a popular pairing. 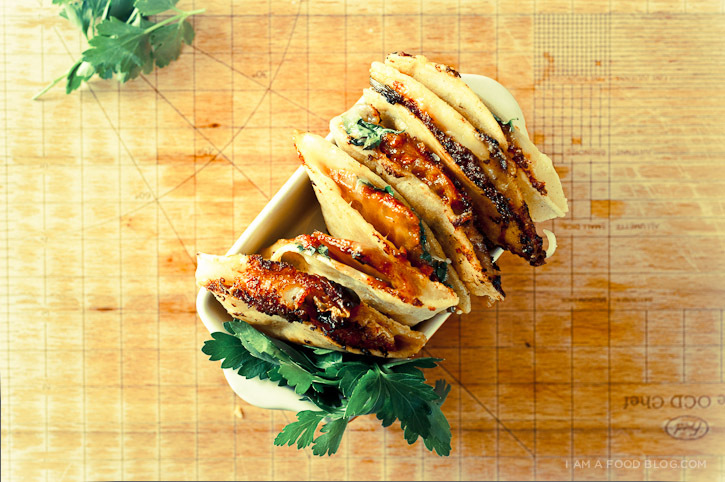 My introduction to kimchi and cheese came from Roy Choi, of the famed LA-based Kogi BBQ truck. True fact: I used to not like kimchi. The thought of fermented vegetables just didn’t do it for me. The kimchi I tasted always seemed too soggy, to slimy, too spicy. What’s funny is that ever since I made my own kimchi, it’s turned into one of my favourite things. I’ll have it with absolutely anything: eggs, rice, even cheese! Kimchi is great for adding a bit of spice and acidity to any dish. For the kimchi-uninitiated, “cooked” kimchi is the best introduction. Cooking the kimchi mellows out its flavours and you’re left something less potent, yet just as flavourful. Kimchi and cheese are the perfect pair for tortillas: the spiciness of the kimchi is mellowed out by the melty cheese. I used corn instead of flour tortillas because I find corn tortillas to be much crunchier, and who doesn’t love crunchy? 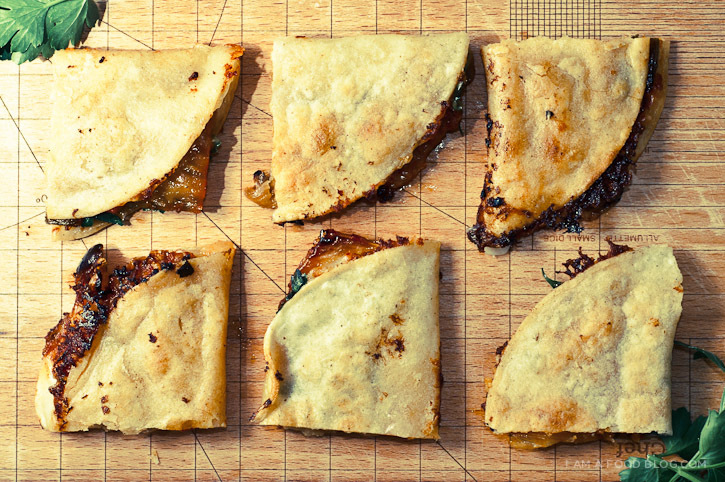 These quesadillas really are the perfect spicy, savoury, crunchy bite. 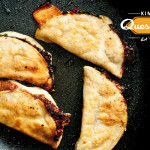 I am Korean, I am Mexican: I am Kimchi Quesadilla! Melt butter in a small skillet over medium-high heat and cook kimchi, stirring occasionally, until edges are golden, about 6 minutes. 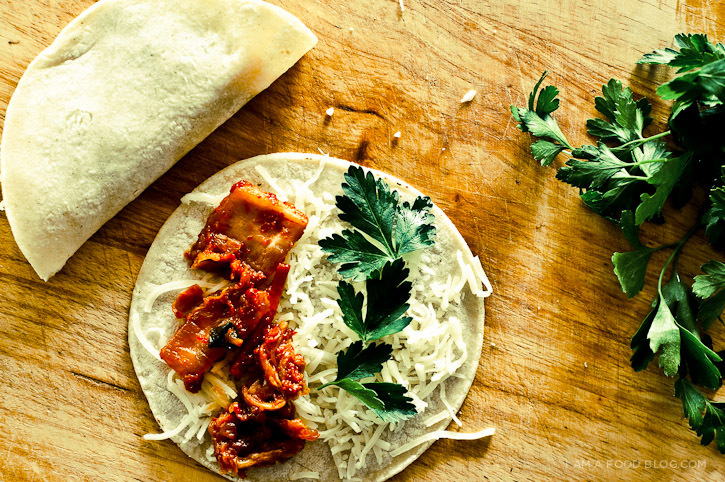 Place several pieces of flat leaf parsley and kimchi on one half of the tortilla. Cover generously with cheese and fold in half to enclose the filling. Repeat with remaining tortillas. Heat a non-stick or cast iron skilled over medium heat. Add enough oil to coat the bottom of the skillet. 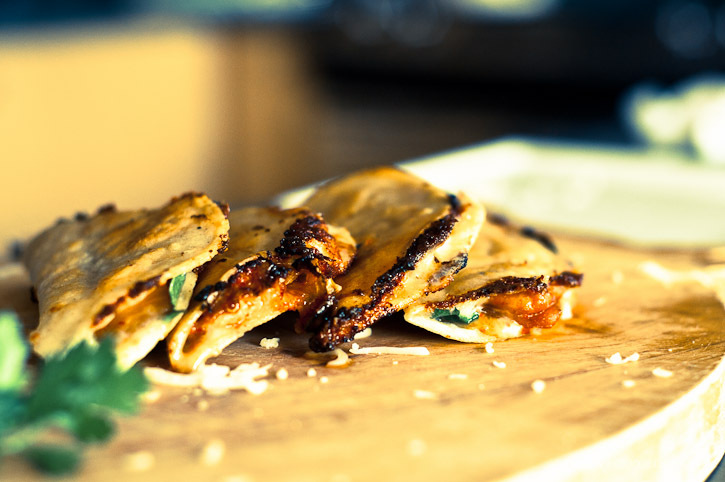 Cook the quesadillas, turning once, until golden brown and cheese is melted. Enjoy immediately. My only addiction in life is Kimchi! I crave it all the time. I havent tried making it yet. I love cooking and my fear is I will fail miserably. I cant wait to try this recipe! Bridget, kimchi is very easy to make. Otherwise, you can buy some, but I recommend you try making some yourself, as it’s way less expensive, and really not complicated! I had kimchi for the first time at a korean bbq – so delicious! I fry my tacos up like that and corn is the only way to go. Yum! This is a great fusion dish I find at alot of taco trucks ! You can check out our blog for a homemade kimchi recipe too ! We can combine the two and BAM! You have a delicious dish. wow, delicious. the whole blog is delicious. found you on tastespotting. These look awesome. There are a couple Korean fusion trucks here in Austin, and one has kimchi fries! 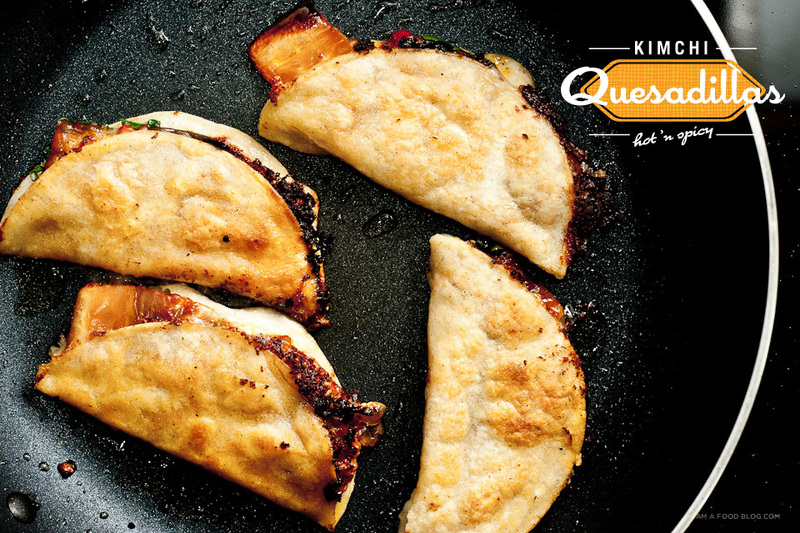 Just made a big batch of kimchi… I’ll try these quesadillas soon! wow, i am impressed, this took me no time at all to make and it is sooooooo good!!!! THANK YOU! Perfect! This was a great way to introduce kimchi to my girlfriend. They were simple and amazing.